This page ain't nothing special design-wise. Just some basic pieces of paper, a border punch, some stitching, little bits, and a title. I almost put the journaling on a label sticker so it wouldn't look "too big" and overwhelm the page. But then I remembered why I was making this page in the first place. My husband lost his father less than a year before we met. Even though I never knew him directly, I've heard so much about him that I have a sense of who he was. And I want our kids one day to have the same thing, even though by the time they get older, memories might fade. So I used this old picture of my father-in-law with his twin boys on their birthday, and made the words the focus. Words + photos = plenty on this page. 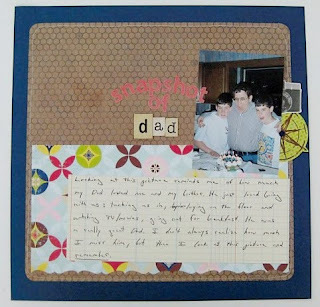 It feels good to connect to something deeper in scrapbooking. I won't say that my scrapping is all about photos and stories, because it's not. It's about the fun of the creative process. From shopping for supplies, to putting pages together, to gluing them down. But every so often, it's good to get back to basics. Although I must say, I'm lovin that new bracket punch! How about you? What's the bottom line for why YOU scrap? Awesome page and love the meaning behind it. Sometimes I find myself wrapped up in the "design" of a page so much that I don't always get the story down. I love when I have the time to really journal on a page. Thanks for the inspo! Love your approach about scrapbooking. It's a KEEPSAKE! You have done just that! So precious!Enjoy the process! Thanks also for stopping by my blog! i constantly have to pull back and remember it's the stories that are most important. well said keshet! What a special page!! My husband's father also passed away a couple years before I met him, and they were very close. I've heard so many wonderful stories about him, and I think a scrapbook page of him would be a great treasure for my hubby and my kids. Thank you for the inspiration Keshkha! love this keshet... this is truly why we love the hobby!! Todd lost his mom to cancer two years before we met. it makes me sad that I never knew his mother, but in a strange way, i feel as if i know her through stories. Now Jonah is starting to ask us "where is daddy's mommy?" i think i need to do a page like this too! thanks for the inspiration. i just love this! and the message behind it is really moving too...a fabulous treasure! i scrap to record our life memories! and cuz it's fun. Yeah...so I pretty much scrap as an artsy outlet more so than a way to memory keep. I am trying to get better at the whole journaling and memory keeping aspect!! So...you won the giveaway on my blog! :) Check it out! I love just capturing the moments! I love the creative process. Thanks for sharing such a meaningful page! I started out because it was a new artform for me. I have always kept a journal, and I have loved taking pictures. I agree, I love to scrapbook. I am sure I will be doing it when I am old and grey, oops I am grey how about old then teehee. stories. photos. creative process. scrap therapy. because it's fun! How awesome to get the story down for your future generations. I LOVE pages that are really meaningful and that come from the heart like yours. And to answer your question, I am not scrapping for a noble cause, but mostly as a creative outlet! I definately know what you mean. Earlier this year when I found out my grandmother had died one of the things I most wanted to do was scrapbook. I did a fun, silly page first, then a heartfelt page about our last visit together, the day before she died. I think scrapbooking can be therapy, spending time with our memories, both the good and the bad.